I am Devay Campbell a Career Coach and Business Mentor, two-time best selling author and speaker. I am a certified HR professional (SHRM-CP) as well. I am honored to be featured in or on Society of HR Management, Essence Magazine, Reader's Digest, MSN, Glassdoor, Fit Small Business, Business Management Daily and the Women Who Lead Anthology. The topics I speak and conduct workshops that helps individuals excel at work and have the career life they deserve. Sample topics are based on: Getting Hired, Human Resources Policy/Issues, Customer Service, Workplace Success, Advancing In Your Career (Career Development), Generational Differences, Leadership, Management or Business. In addition to being HR certified, I also have a conflict mediation, EEO (Employment Laws) and Behavior Interview Certificate. I have served non profit organizations, K-12 schools, small businesses colleges and corporations. Here are a few reviews from past clients and/or attendees. If you ever have the chance to interface with Devay, or have her do a workshop for you, it is a big mistake if you do not enlist her to do it! She is an outstanding presenter, speaker, seminar leader without too many peers. There is nothing that I can say more than she is the best and knows her "stuff" ! Highly recommend her for anything involving HR, Training or Motivation. Don Witte, MBA. Career Consultant at Forsyth Technical Community College. Devay Campbell is awesome!! Devay presented on behalf of Graduate Service Program of Goodwill NWNC. Power Plan Your Personnel Brand!!!! Devay empowered the audience with knowledge, laughter and HOPE!!! I had a client to tell me how the event helped him as far as landing him employment!!!! I must take this time to thank you for being our special guest speaker for Vision III. The Vision Conference was created to help individuals understand how to obtain their true purpose personally, professionally and spiritually. Having you as our keynote speaker made the Vision III a huge success. Your message captivated the audience the entire time. I appreciate that you were well prepared and informative. You brought the energy that was needed. After the Vision II, the audience was equipped with tools they needed on how to identify, embrace, seek, and apply their purpose and opportunity. You truly WOWED the audience and left an outstanding impression on us all. I would love to have you return for the Vision IV next year. Ms. Campbell is energetic, engaging, and inspiring to say the least. After having that opportunity to work her on two different occasions for vastly different audiences I can confidently recommend Ms. Campbell for training on job readiness and visioning/branding. The first time I worked with Ms. Campbell, I was serving as an AmeriCorps VISTA and she volunteered to do a training session with our clients. The population that we serve are the working homeless and those experiencing poverty. During this session she provided everyone with tools and tips on how to get back into the job market, how to go through an application, and what a job interview looks like. 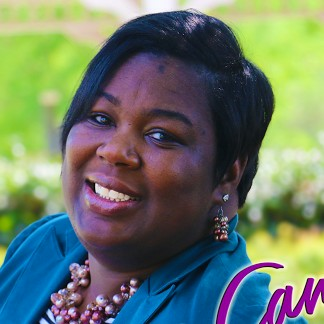 In the reviews of the session many folks said that Ms. Campbell inspired them to continue their job search in the face of obstacles and disappointment. The next time I encountered Ms. Campbell she did a joint session with Ms. Albright about visioning and branding yourself. This session was for the staff at a non-profit, she encouraged us to think about how we want to brand ourselves, what we want to be known for, and also aided in recognizing where each one of us would like to be in the future. It can be easy to become complacent when live takes over- of you have kids or a job, hr reminding everyone to focus on their goals and dreams. I highly recommend Ms. Campbell. The combination of her empathy and encouragement really being a new dimension to conversations about job readiness and branding. She is also a living testament to what she is preaching- which shows folks that they too can achieve their dreams and live out their passions. Thank you for your consideration. I am looking forward to working with you! Find out more about Devay Campbell at http://www.devaycampbell.com.